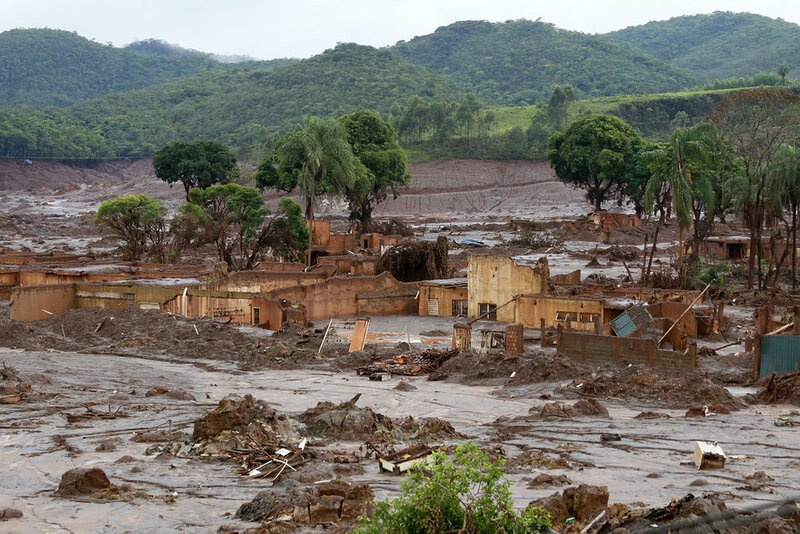 Tragedy struck Brazil on January 25 when a dam in an iron ore mine in the southeast state of Minas Gerais suffered a catastrophic break. It has led to over one hundred deaths, with hundreds more deemed missing, and continued environmental threat to indigenous people in the surrounding area. This humanitarian crisis may become worst environmental disaster in Brazilian history. The burst sent 12 million cubic meters (423 million cubic feet) of mud and debris towards surrounding villages and buried entire buildings. In addition to human casualties, nearby rivers have been contaminated by the onslaught of debris. Indigenous people living in the surrounding area now rely on a polluted river to source their fish and drinking water. Government officials have declared the water unsafe for bathing and irrigation, which poses a serious threat to these peoples. According to Brazil’s Attorney General, there are over 600 dams just in the state of Minas Gerais that are at risk of bursting. The transnational company Vale operates the iron ore mine and was previously responsible for a separate dam collapse in 2015 that killed 19 Brazilians. As the worst environmental disaster in Brazilian history up to that point, it left hundreds of thousands without water and resulted in the death of many species in the area. Vale promised compensation to the victims as reparation, but did not follow through. In the aftermath of this tragedy, state courts have frozen billions of dollars of Vale’s assets and its stock price has plummeted. Police arrested five employees for alleged environmental crimes and investigations continue into the management of the company. After two major environmental catastrophes in three years, Vale will likely face further sanctions and fines as the Brazilian government attempts to investigate the causes of these disasters. In a sign of growing ties between Brazil and Israel, over a hundred Israeli soldiers have flown to Brazil in order to help with rescue efforts. This builds on the strong relationship between Brazilian President Jair Bolsonaro and Israeli Prime Minister Benjamin Netanyahu. Bolsonaro previously announced that the Brazilian Embassy in Israel would be moved from Tel Aviv to Jerusalem, improving relations between the two countries. Search and rescue efforts continue in Minas Gerais, although state officials report that the chances of finding remaining survivors decreases dramatically every day. Investigations into Vale and regulatory agencies in the state will continue in response to the worst environmental disaster in Brazil’s history.